The initial invention of masonry fireplace designs was a necessity. It was used for cooking and to heat the interior of the home. Today, they are primarily used for ambiance and supplemental heat. The smell of burning wood and sound of a good fire are inviting as well as romantic & relaxing. They are typically constructed of brick or stone and are freestanding on their own footing. The fire’s smoke & fumes are vented up the chimney. It is critical for maximum efficiency that a vent (fresh-air intake) be installed to bring in outdoor air into the fire chamber for combustion air. This way, much less air from the indoor air is wasted up the chimney, which is why older wood burning fireplaces were very inefficient. The picture to the right is an example of a full masonry wood burning fireplace. Below are a couple of links to designing masonry fireplaces. A fantastic article on successful fireplace design. 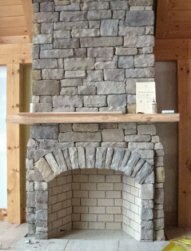 Masonry wood burning fireplaces would be the most expensive to build/install due to the amount of material & labor involved, however they provide you with the largest fire possible (wood or gas logs). Gas logs can be installed in any wood burning masonry fireplace. Click here for various fireplace pictures. Wood burning fireplaces require the most work (splitting firewood) and need periodic cleaning for proper safety. It is important to have proper screening in front of the fireplace to catch any embers that “pop” from the fire. Using proper firewood is also important. Hardwoods are best, since they burn well and emit high heat with little or no smoke. Hardwoods, such as ash, oak, birch, beech, hickory & hard maple are optimum for wood burning purposes. These woods are easier to split than most other varieties. Availability will vary depending on the region you live, since not all trees grow in all climates. It is recommended to avoid sap type trees, as they will produce more smoke, burn quickly and the chimney will need to be cleaned more frequently. Make sure the firewood has been seasoned (dried) before burning. "A solid concrete foundation will out-perform any other type of foundation. It is stronger and more difficult for moisture to pass through it." The basement is the preferred foundation of choice. It is inexpensive additional square footage that can be used as finished living space, storage, mechanical rooms, etc.